The Association was inaugurated in October 2008 and was the brainchild of Nico de las Peñas and his brother Jorge, after a visit to their first-ever Harmony College in Coesfeld, Germany, SABS has become a reality because of their tenacity, enthusiasm and determination and Nico was a natural choice as our first President.As a young association, we are still spreading the barbershop word and building our membership, which currently stands at almost 200, comprising men’s, women’s and mixed groups from all around Spain. We celebrated our first-ever festival of barbershop in Spain with ˜En Armonía” in June 2009 and we were delighted to welcome UK’s Finesse ladies’ quartet and two of the Ringmasters “Martin and Rasmus“ from Stockholm, Sweden. Our first true get-together was attended by almost all our members and was a resounding success. En Armonía 2018 will be held in Benalmádena, Málaga from 6 to 8 April We are delighted to welcome quartets and choruses from Spain, America, Holland, Germany, Ireland and the United Kingdom, who will be taking part in our tenth international contest. SABS first meeting in Gandia – July 21 July 2008 – Gandia (Valencia) was the location of the first meeting of various barbershoppers and a Sweet Adeline from different areas of Spain, who decided to form SABS. 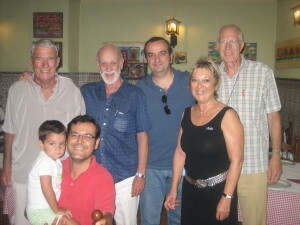 From right to left of the photo are these founder members: Tony Colgrave (SABS Treasurer), Lyn Baines (SABS Marketing Manager), Nico de las Peñas (SABS President), Roger Gallant (SABS Vice President), Angel Rodriguez with his son, Santiago, and Dudley Jones (SABS Executive Members).